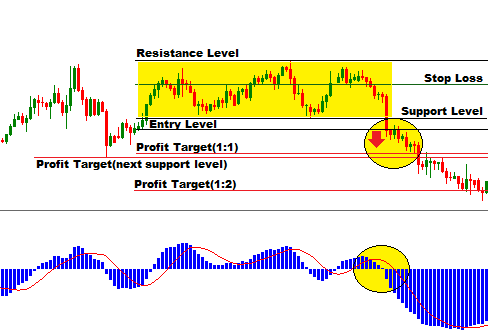 Support and resistance level breakouts strategy is always been considered as effective trading strategies by the winners in forex trading. A support level indicates that the financial market is finding it difficult to break through it, and may head higher in the near term. In other way, a resistance level indicates that the financial market is finding it difficult to break through it, and may head lower in the near term. 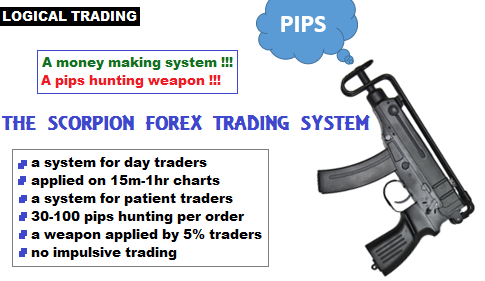 Today, I am going to introduce you with a new forex trading system that is developed on the support and resistance breakouts trading strategies.I named this trading system after the name of Scorpion, a gun,because I considered forex trading as a war. And I want to be a winner in the forex trading war. -It is developed on support and resistance level breakouts. -30-100 pips gain per order. 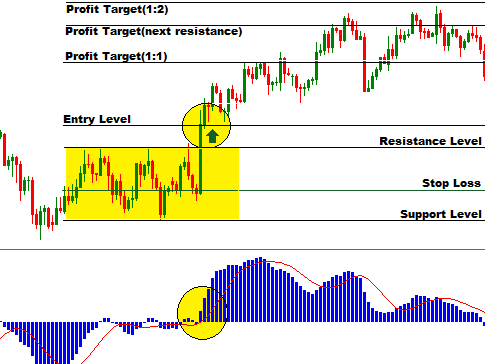 -This trading system gives logical trading signals. -It should be applied on the 15m-1hr charts. -Only MACD indicator is required. How to execute a long trade with "The Scorpion" forex trading system? (a) Find support and resistance lines considering the swing highs and swing lows. (b) The first step will make a horizontal channel, and the width of the channel should not be that large. (c) We will go long when the resistance line breakout takes place, and at the same time, the MACD histograms turn into positive territory or grow longer in the positive territory. (d) The stop loss for the long trades should be placed at 60% of the channel width. (e) The profit target should be at the next resistance level or at the 1:1/1:2 risk to reward ratio. How to execute a short trade with "The Scorpion" forex trading system? (c) We will go short when the support line breakout takes place ,and at the same time, the MACD histograms turn into negative territory or grow longer in the negative territory. (e) The profit target should be at the next support level or at the 1:1/1:2 risk to reward ratio. ***Note: The most tricky part of this trading system in finding the support and resistance lines considering the swing highs and the swing lows .It is not necessary to make the support and resistance lines to touch every swing highs or every swing lows. If there are three swing highs and three swing lows, we will draw the support and resistance lines through the swing lows and swing highs respectively (if possible). If we cannot draw the support and resistance lines through all of the swing lows and swing highs respectively, the support line should be drawn through the lowest low, and the resistance line should be drawn through the highest high. Remember, the rest highs and lows should be relatively close to the resistance line and support line respectively. Dear Traders, If you have any question regarding this post, you can drop it into the comment section below. I generally respond to your comments within 24 hours.